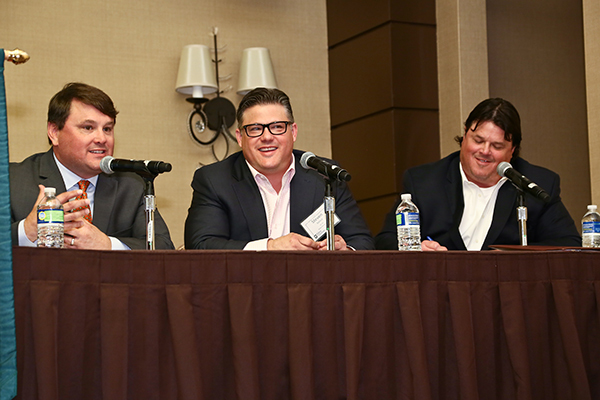 Ballard Brands founders Scott, Steven and Paul Ballard, left to right, discussed the history of the company in March at a luncheon hosted by the Tulane Family Business Center. When Paul Ballard was an undergrad at Tulane, his future wife turned him on to a drink that would change his life. Inspired by their shared love of PJ’s, Paul and his wife, Torry, opened their first PJ’s Coffee franchise in Covington in 1995 and followed that with a store in Baton Rouge. At the same time, his brothers — and fellow Tulane graduates — Scott and Steven, along with their wives Kristi and Lori, began opening Smoothie King and PJ’s Coffee shops in North Carolina. In 2001, Paul branched out into the restaurant business with the opening of WOW Cafe, a quick-service restaurant he developed. The concept was one the brothers thought they could grow and franchise, so in 2002 Scott and Steven sold the businesses in North Carolina and moved their families back to New Orleans to join Paul in expanding the company. In 2008, the Ballards purchased PJ’s Coffee of New Orleans from Raving Brands, and in 2012 they founded Ballard Brands to serve as the parent company of their growing portfolio, which now includes PJ’s, WOW Cafe, the Original City Diner and Boardhouse Serious Sandwiches. Today, the company owns or franchises nearly 150 locations across the U.S. and internationally in both traditional and non-traditional models. They also own New Orleans Roast coffee, which is sold in grocery stores, restaurants, hotels, airports and other locations. Most recently, the company expanded the PJ’s Coffee brand into Vietnam. In March, the A. B. Freeman School of Business honored the Ballards with its 2017 Outstanding Family Enterprise Award. Presented by the Tulane Family Business Center, a program of the Freeman School’s Lepage Center for Entrepreneurship and Innovation, the award recognizes family-owned companies that combine business success with service to the community. 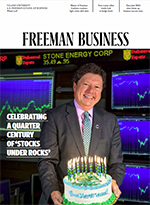 “Family businesses are the bedrock of our economy, so it’s exciting to see the great success that Paul, Scott and Steven have achieved, especially given their close relationship with Tulane University,” said Freeman School Dean Ira Solomon. The award was presented during a luncheon discussion hosted in conjunction with New Orleans Entrepreneur Week in which the brothers told the story of the company and reflected on their experiences as entrepreneurs. While each had a different path to success, the three agreed about the important role that Tulane played in their lives and careers.